Preheat oven to 160°C (or 140°C for fan forced ovens). Place English muffin halves onto a large baking tray lined with baking paper. Spread a tablespoon of pizza sauce onto each half and top each with a generous amount of shredded cheese. Add desired amount of tomatoes, pepperoni or other toppings of your choice to each muffin. Bake for approximately 5-10 minutes, until cheese starts to bubble and turn golden. 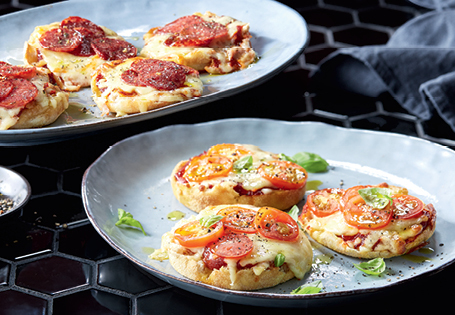 Remove from oven and dress your pizza muffins. For cheese and tomato muffins, top with salt and pepper, a few basil leaves and a drizzle of olive oil. For pepperoni pizza muffins, sprinkle over Italian seasoning and drizzle with olive oil.